Distance from the Liberty Stadium: 223 miles ~ 4 hours 10 minutes. Built not far from the site of the old ground (Millmoor), away fans are in the Mears Stand at one end of the AESSEAL New York Stadium, as it is known for sponsorship purposes. There’s a range of pies available inside the ground, jumbo sausage rolls, hot dogs and cheeseburgers. Similar to the Liberty stadium, smokers are allowed outside for a smoke at half time. There’s a large TV on the concourse showing Sky Sports. Fosters and John Smiths (pints), bottles of Heineken and Bulmers are sold plus red, white and rose wines. Unlike most new stadiums, the New York Stadium is close to the town centre, so good transport links and a fair choice of hotels, eating and drinking places are nearby. Rotherham is a large town in South Yorkshire and is situated just 5.5 miles away from Sheffield. Yorkshire has a lot to offer any visitor and a game this far north, makes for an ideal weekend away to explore the area as well as watching the Swans! Hotels nearby include Carlton Park Hotel (S60 2BG), 1.1 miles away, Brentwood Hotel (S60 2TY), 1.6 miles away, Fitzwilliam Arms Hotel (S62 6EE), 2 miles away and Holiday Inn (S60 2XL), 2.5 miles away. In terms of entertainment, the night of the game at its Circus of Horrors – Psycho Asylum at the Civic Theatre (S65 1EB), tickets are £20-£23. The next night at the same venue, The South perform, members of The Beautiful South have reformed, tickets are £23.50. The Cutlers Arms (S60 1BQ) has The Labrettas on the night of the game, tickets are £14. Again, the night of the game Kyle Falconer plays The Plug (S1 4QD) in Sheffield. The Cutlers Arms (S60 1BQ) 0.4 miles away has a mix of home and away fans and sells beers from the local Chantry’s brewery. Nearby is the New York Tavern (S60 1BD), 0.5 miles away, it also serves Chantry’s beers. The Prince of Wales (S60 1HX) is 0.5 miles away, has Sky TV, a games room and serves food, whilst there are rooms available upstairs should you choose to have an overnight stay. Two Wetherspoon pubs are The Bluecoat (S60 2DJ), 0.9 miles away and The Rhinoceros (S60 1PL) 0.8 miles away. Stadium parking is for permit holders only, but there are a number of pay & display car parks around the town centre. Otherwise, street parking is around the old Millmoor ground, a 15-minute walk (0.5 miles) away from the visitors entrance. There’s a multi-storey car park next to the Interchange Bus Station (£2.80 for 4 hours). You can also choose from a small selection of private car parking spaces near the ASSEAL New York stadium – including on-street parking, off-street car parks and around 4 reservable parking spaces from just £3.00 per day. 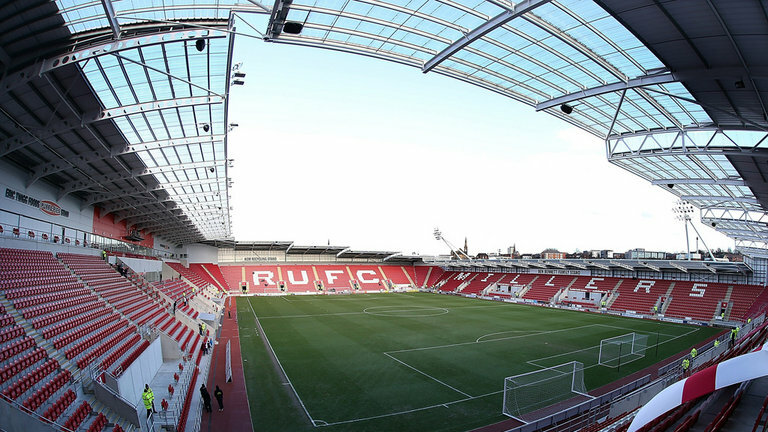 Rotherham Central is a 5-minute walk from the stadium, it’s almost directly behind the stadium. Come out of the station, turn right onto Central Road, follow this road to the ground. Trains leave Swansea at 06:29, 06:47, 07:29 and 07:44 for the 5.5 hour journey. Trains back are at 17:28 and 18:28 getting in at 22:44 and 00:03. If you’re travelling by train, changing at Sheffield station, platform 1 has the Sheffield Tap, which serves real ales and run by the local Thornbridge Brewery.